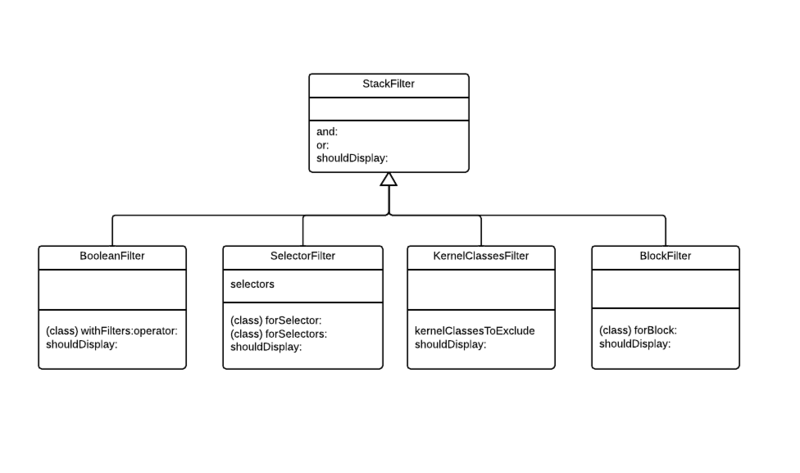 Filtering the stack – Episode II: Refactor strikes back. | Valhalla, I'm coming! BooleanFilter is a filter subclass, which know how to actually combine two filters. SelectorFilter is a filter for an specific selector or collection of selectors. BlockFilter provides a way to create filters from any (boolean) block. fromBlockFilter := [:ctx | ctx isNotNil] asFilter. "first loop: add to the newStack those contexts that should not be displayed"
self stack do: [ :aContext | [aFilter shouldDisplay: aContext ] whileFalse: [ newStack add: aContext. ctx := aContext ] ]. "second loop: add the top contexts to keep track of where in the execution we are"
That code could easily be extended to handle more than two filter combination, by folding #shouldDisplay: message send results. So finally, to avoid having lots of class variables in SpecDebugger to toggle filters, we decided to create a new widget, whose responsibility would be to handle filtering actions. But for the moment, that responsibility still remains on the debugger. Now, a few words, not so unrelated. This year’s Google Summer of Code is ending, and even tough i didn’t make it to the final goal (remember I told you we’d call Heimdall to open the Bifröst?) due to some technical restrictions, I want to say that I’ve learnt a lot, and that I am really thankful to my mentors and to all the Pharo community for the support they’ve given me through this months. I will keep on working on the debugger, but since it won’t be for gsoc anymore… thanks. So, thank you for reading, and stay tuned!